French label converter Stickem has recently added Ravenwood’s linerless technology to its product portfolio after investing in a Com500 Coater. The company, based in Normandy, is now an officially approved partner of Ravenwood for producing linerless labels. CEO Frédéric Leyva learned of Ravenwood’s linerless technology at Labelexpo Europe 2017 and from recommendations from customers. Leyva was attracted to the cost savings that linerless offered including the sustainability benefits for skin pack labelling and moving away from labor-intensive carton board sleeve application. Leyva said: ‘As a business, we are looking to reduce our energy consumption and seeking ways to reduce and recycle our waste. Linerless is another step we have taken in becoming more environmentally friendly and in doing so, we have expanded our product offering. 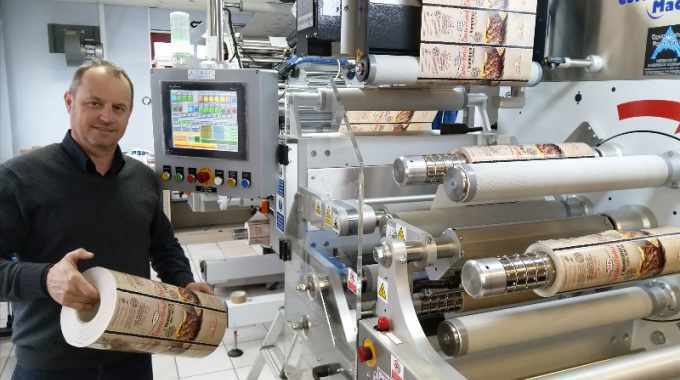 The Com500 Coater is installed at the Stickem factory in Normandy and to date, the machine has produced in excess of five million linerless labels. Designed and manufactured in the UK, the coater is the only machine dedicated to running Ravenwood linerless labels. Linerless is a specialist process that applies silicone and strips of hotmelt adhesive to pre-printed labels, resulting in label reels that have no backing paper. These reels have 40 percent more labels per roll and require 40 percent less storage space. As well as linerless, Stickem also specializes in self-adhesive print in UV flexo and digital, and two and three-ply labels for chemical products. Stickem formed 40 years ago with Frédéric Leyva purchasing the business in 2007. The company employs 43 people with plans to relocate to a new purpose built factory in June of this year.